Find a great sale price on this 2017 Subaru Impreza at Mira Motors in Ontario CA. This 2017 Subaru Impreza is located at our dealership in Ontario. We also serve the cities of Pomona, Rancho Cucamonga, Chino, Riverside, and San Bernardino. 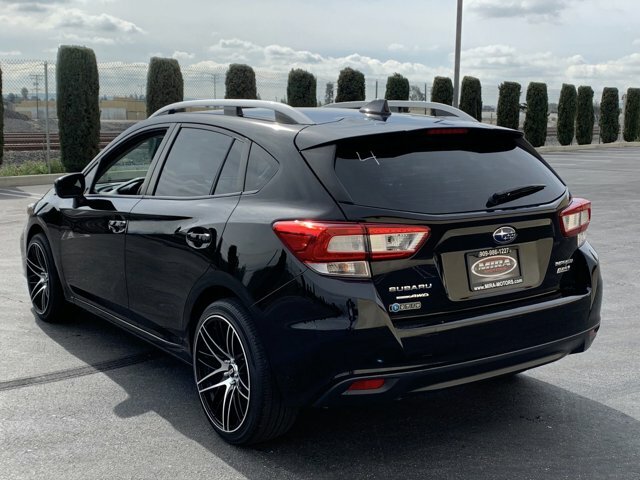 So if you're looking for a great price on this 2017 Subaru Impreza or just looking to get an auto loan for the vehicle you want... you've come to the right place! Mira Motors. KBB.com 10 Most Awarded Cars. Only 20,747 Miles! Scores 37 Highway MPG and 28 City MPG! This Subaru Impreza delivers a Regular Unleaded H-4 2.0 L/122 engine powering this Variable transmission. SUN SHADE -inc: Part number SOA3991310, REAR BUMPER APPLIQUE -inc: Part number E771SFL010, CRYSTAL BLACK SILICA. *This Subaru Impreza Comes Equipped with These Options * CARGO TRAY -inc: Part number J501SFL300, BSD & RCTA/SRF/MOONROOF/EYESIGHT -inc: Power Moonroof, tilt up, internal retracting, laminated glass, UV and dark tint and auto-open/close, Blind Spot Detection, Rear Cross Traffic Alert, Steering Responsive Fog Lights (SRF), EyeSight System, pre-collision braking system, braking system off switch, brake assist and throttle management (engine control), lane departure, lane keep assist w/on/off switch, sway warning and off switch, lead vehicle start alert (vehicle in front) and adaptive cruise control, BLACK, CLOTH UPHOLSTERY, AUTO-DIMMING MIRROR W/COMPASS & HOMELINK -inc: Part number H505SVA101, bulk bag kit, part number H505SFL010, Wheels: 16" x 6.5J Silver Finish Aluminum Alloy, Variable Intermittent Wipers w/Heated Wiper Park, Valet Function, Urethane Gear Shift Knob, Trip computer, Transmission: Lineartronic Continuously Variable -inc: low shift mode, steering wheel paddle shift control switches and 7-speed manual shift mode. * The Votes are Counted * KBB.com 10 Most Awarded Cars, KBB.com 10 Best All-Wheel-Drive Vehicles Under $25,000, KBB.com Best Resale Value Awards, KBB.com 10 Best Sedans Under $25,000, KBB.com 10 Coolest New Cars Under $18,000. * Visit Us Today * Stop by Mira Motors located at 849 W. Holt Blvd., Ontario, CA 91762 for a quick visit and a great vehicle!